Tuberous begonias are a wonderful flowering plant for folks with shady areas that could benefit from some flowering color that will last right up until first frost. As the name implies these begonias grow from tubers rather than seeds or cuttings like other begonias. They sport showy flowers that come in a wide range of sizes and colors. There are even hanging varieties. Besides being a great choice for planting in flowerbeds, tuberous begonias are happy to grow in containers that you can place about the shady patio or balcony. 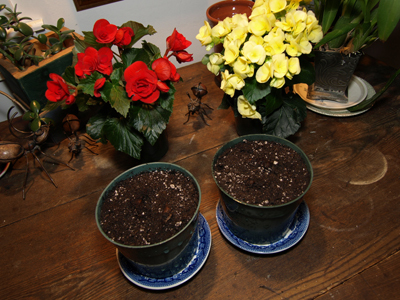 Since tuberous begonias are slow to start, it’s best to start them indoors during February through mid-March. It’s also a great winter activity for the desperate northeastern gardener who’s yearning for the feel of soil and the sight of something…anything that’s growing. To make a good show in the garden, you’ll want to start several begonia. Choose pots that are an inch or so larger than the begonia tuber. 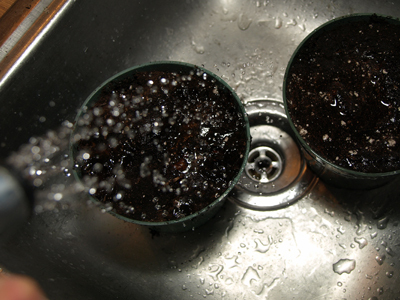 Fill the pots or trays with a good STERILE potting soil that’s high in peat content. 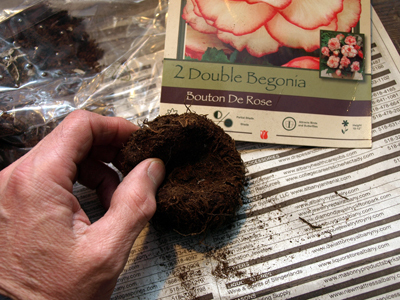 If you want to start many begonia tubers, you can start several in an 11″ X 22″ seed tray and pot them up later on. You should be able to start ten or so tubers in a single tray. When you’re picking out your tubers at the garden you’ll notice that the lumpy round tubers are domed on one side and slightly dished on the other. The dished side of the tuber is the top. Starting them is a snap. Simply nestle each tuber into the soil, dished side up, into your pot or tray just barely below the surface of the soil. You should cover the top of the tuber but not with more than a half of an inch of soil. You can see how close to the surface begonia tubers should be. I’ll add another 1/2″ of soil and that’s all. Water in with room temperature water. Make sure the container you’re using has a drainage hole. Begonias will rot easily if kept too moist. After the initial watering. keep the soil just lightly moist. Don’t water again until the soil is actually dry an inch below the surface. Poke your finger in to check. Depending on the variety you’ve chosen, sprouts will appear from one to five weeks after planting and watering. Once the first shoots appear, make sure that you keep the soil from drying out; still avoiding sogginess since begonia tubers can rot easily if kept too moist. Frequent light watering is best. If you’ve started them in flats you’ll want to transplant them into individual pots after five or six leaves have developed. If you plan on growing them in containers all summer, this would be the time to plant them into their “display pots”. They’ll need lots of bright light but no direct sunlight. Once they start growing, you can speed them along with HALF strength balanced (20-20-20) liquid or soluble plant food every two weeks (no, more isn’t better). Once ALL danger of frost has passed in spring (late May to you) you can transplant them into their summer bed. I like to cover mine for a few days with horticultural fabric to allow them to get used to outdoor light after growing indoors. Remember, they prefer shade so make sure they don’t get direct sunlight. An hour of the day’s first rays won’t hurt them but avoid any afternoon sun completely. Now all they need is a little of the liquid plant food every couple of weeks and regular removal of spent flowers and they’ll just go and go. Since begonia tubers are quite tender, you’ll want to lift them from the soil immediately after the first frost nips them in fall. There’s no sin in taking them out a bit before frost gets them. Better safe than sorry. Snip off all the stems and place the tubers on a sheet of newspaper to dry. 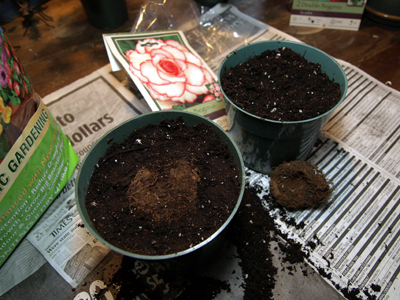 Brush off any loose soil and dust them with a good bulb dust to help prevent mold. Place them into a shoebox of sterile potting soil for winter storage. Store them in a cool place that won’t freeze. Get them out next winter and start all over again. If you never have, give tuberous begonias a try. They’re easy to start and you’ll have fun playing in the dirt as we wait for the frozen world outside to thaw.